I came from a farmer family, and I could only understand the literal meaning when studied "if you cut the weeds without digging up their roots, they'll grow again when the spring breeze blows." I moved to a log cabin community beside Pao-Shan 1st Reservoir after retirement, by then I realized the proverbial philosophic theory signifies not merely cutting weeds, but also purifies my spirit after taking care of the1,779 sq.ft. lawn in forecourt and 2,135 sq.ft. kitchen garden in backyard for few years. There are only 18 families in this log cabin community, and natural ecology has maintained well so that there are numerous protozoans, also lots of poisonous snakes which were released by kind people. For living safety, I planted prostrate Manila Grass in forecourt because it is smooth and green for snakes would not be hiding in. It is both beautiful and safe. But the wind borne seeds of awn, acacia, Chinese ash and birds' excretion sowed seasonally, and then it grows into weeds and saplings at any time. If I neglect them, my beautiful greensward would be occupied by shortleaf kyllinga herb, lawn pennywort herb, herba lysimachiae, blue-green algae, dandelion and purple oxalis within one month. I am gratified by preserving yard and kitchen garden well, still is beautiful and safe even though I have been living here more than eight years, and all the achievement has been made by my wife and me. Look around my neighbor's yard which was green and flat, but now weeds trail too fast to keep as lack of maintenance. The skill of weeding does not sound easy as the old sayings: "if you cut the weeds without digging up their roots, they'll grow again when the spring breeze blows." It is already a challenge on physical strength, lumbar force, eyesight and endurance, squatting for half an hour cutting, for instance. luckily I and my wife both practice Qigong in Tai Ji Men and follow Shifu to cultivate body and mind, so we are able to endure the test of long-term physical hard work and patience, see weeds cutting as practicing kungfu. I realize the wisdom of life from weeding labor. In order to keep the clarity of heart, I first need to clean my heart, just like keeping greensward smooth and pure. Any provocation in life or work can pollute pure heart when one is reckless; five afflictive thoughts: avarice, anger, rapture, arrogance, suspicion are just like weeds seeds. Hence weeds cutting is no mere weeds cutting, but also purifying spirit. Time goes fast, I and my wife have married for 16 years. Quarrel gets less and less but praise and appreciation get more and more between us. We don't talk much but we know each other's mind; when life gets simpler it also gets happier. Both of us were married for the second time. 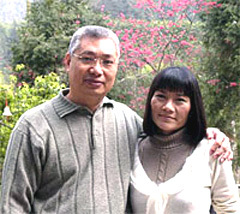 At first we both had a bad temper, but we learned how to cultivate body and mind as well as how to get along with people after receiving the teaching by Shifu for 20 years, we work our wisdom into daily life, and we cherish each other. For all of these, I would like to appreciate Shifu's instruction. Spring comes again, flowers of orange and tangerine are blooming, full of whiteness, fragrance spreads in the air; I listen to the music and drink a cup of tea with my wife, I smile – who could ask for more?